We at Kobold Press and Open Design LLC are committed to protecting your personal information. This policy applies to transactions made and data gathered on the KoboldQuarterly.com website, and does not apply to any other website or offline contact between Kobold Press and consumers. Each time you visit KoboldQuarterly.com or provide us with information, you are accepting the practices as described in the policy at that time. We use the information you provide for us to help us deliver the services you have requested, to contact you when necessary in connection with those service requests, and to send you information regarding your order or requested services. Note that you cannot opt out of transactional emails, such as order confirmations or shipment notices. In some cases, it is necessary for us to provide information particular to you to a third party. For example, in the case of the magazine that we publish, it is necessary for us to provide your name and mailing address to the printer for the production of delivery information and/or to a delivery company so that you can receive your magazine. 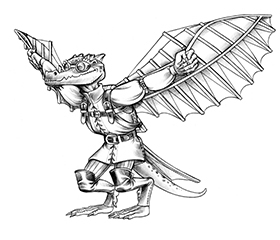 If you use the private messaging system of the Kobold forums, messages sent and received are visible to the sender and recipient. Messages may be reviewed by Kobold Press staff or disclosed to appropriate law enforcement agencies if required to do so by law, or in the good faith belief that such action is necessary to investigate abuse or ensure personal safety. Open Design LLC does not allow other companies to offer our registered customers information about their products and services. Kobold Press and Open Design LLC may disclose your personal information if required to do so by law or in the good faith belief that such action is necessary to: (a) conform to the edicts of the law or comply with legal process served on Open Design LLC or the Kobold Press site; (b) protect and defend the rights or property of Kobold Press and its web sites, or (c) act in urgent circumstances to protect the personal safety of users of Kobold Press, its web sites, or the public. Your information may be stored and processed in the United States or any other country in which Kobold Press or its affiliates, subsidiaries or agents maintain facilities, and by using this site, you consent to any such transfer of information outside of your country. Kobold Press abides by the safe harbor framework as set forth by the U.S. Department of Commerce regarding the collection, use, and retention of data from the European Union. When you register, or otherwise give us personal information, Open Design LLC will not share that information with third parties without your permission, other than for the limited exceptions already listed. It will only be used for the purposes stated above. Tell us whether you want Kobold Press to send you marketing information. Open Design LLC will occasionally update this privacy statement. When we do, we will also revise the “last updated” date at the top of the privacy statement. For material changes to this Statement, Open Design will notify you by placing prominent notice on the web site.